Size : 12.4 x 16.6 inches. / 31.5 x 42.2 cm. 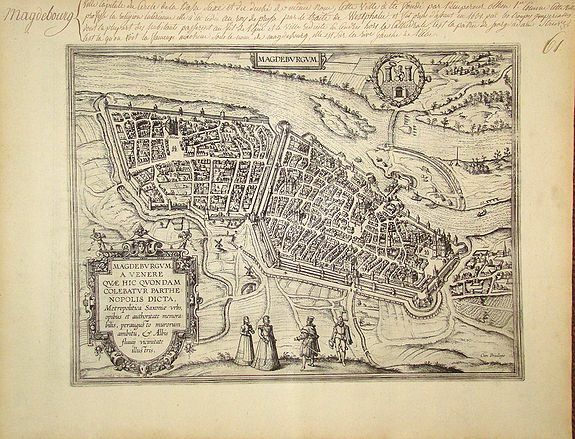 Description :Early view of Magdeburg, a bird''s eye view from the greatest publication in this genre ! The Civitates was compiled and written by George Braun, Canon of Cologne Cathedral. Braun gathered together vast amounts of information and draft plans to produce over 500 city views/maps published in six parts between 1572 and 1617. Most of these engravings were made by Simon Novellanus and Frans Hogenberg, many after drawings by Joris Hoefnagel. Condition : Paper slightly browned. Generally good. Nice and dark impression. With marginal manuscript notes in a 19th century hand.